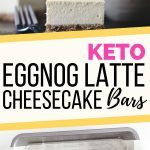 These Eggnog Latte Keto Cheesecake Bars are insanely delicious. You must try this secret ingredient crust! 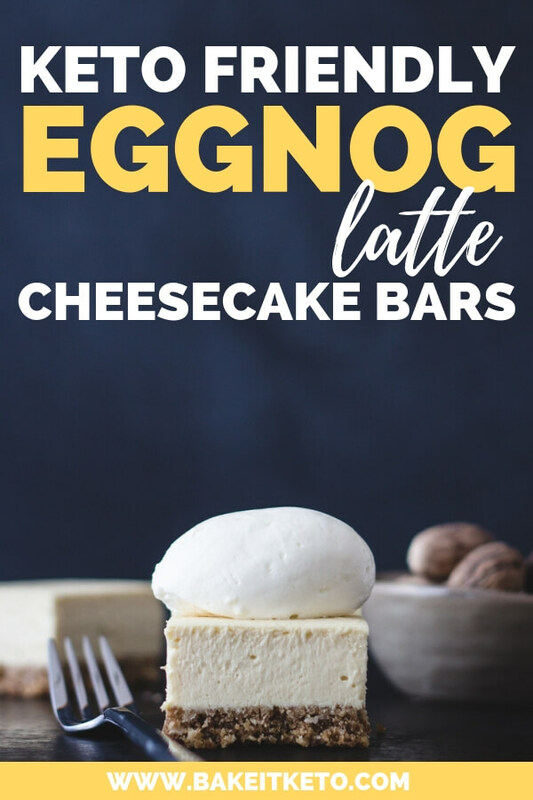 These Keto Eggnog Latte Cheesecake Bars have a secret! I haven’t made too many cheesecakes since I realized I was sensitive to almonds. Most of the low carb cheesecake recipes out there call for an almond flour based crust, so I knew I was going to have to figure something else out. I thought about substituting another nut, but that wouldn’t help low carb eaters who are sensitive to all tree nuts. So this crust is made with a secret ingredient – pork rinds! And it is seriously delicious. I used one 2.5 oz bag of Epic Baked Himalayan Pink Salt Pork Rinds broken up in the food processor with a little flaked unsweetened coconut (to add a touch of chewiness), cinnamon, and brown Swerve sweetener. Coconut is not a botanical nut, but if you have both a nut allergy and a coconut allergy, you could just omit the coconut and the recipe will still turn out. 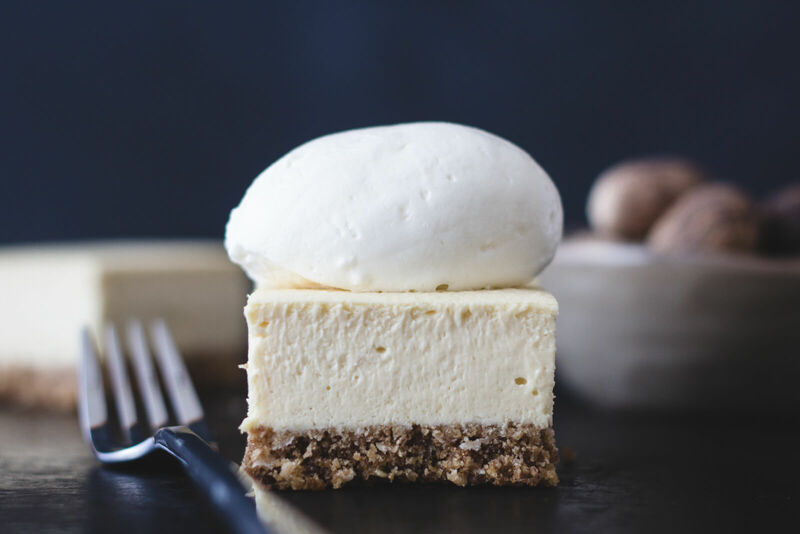 Making keto cheesecake bars is the perfect way to make a quick keto cheesecake! The baking time is much shorter than a full-size cheesecake, as is the cooling time. These bars are much easier to transport to a holiday party, and you can taste test the cheesecake without anyone knowing one went missing! 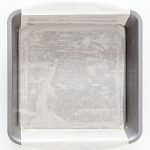 Grease an 8-inch square baking pan and line with foil or parchment. I used a nonstick metal pan, lined with a strip of parchment. In the bowl of a food processor, combine pork rinds, flaked coconut, cinnamon, and brown Swerve. Pulse until the mixture is the texture of coarse crumbs. Add melted butter to food processor and pulse to combine. Press the crust firmly into the pan. I used a second pan of the same size to press it down. Bake at 375 degrees F for 8-10 minutes, or until the crust just starts to brown around the edges. Set the crust aside while you make the filling. Lower the oven temperature to 325 degrees F.
In the bowl of a stand mixer fitted with a paddle attachment, cream together softened cream cheese and granulated Swerve. One at a time mix in the eggs, followed by the heavy cream, and then the coffee, scraping with each addition. Add the vanilla, rum (if using), nutmeg, cinnamon, and salt. Scrape the cheesecake filling into the prepared crust. Gently tap the pan on the counter to spread the filling evenly. Bake at 325 degrees F for 35-40 minutes, until the filling is set and jiggles as one. Allow to cool for 60 minutes before putting in the fridge to chill. Chill the cheesecake for at least 60 minutes (overnight if possible). Use the foil or parchment to pop the cheesecake bars out of the pan and transfer them to a cutting board. If the bars are stuck, just dip the bottom of the pan in a dish of hot water for a minute to gently warm the outermost layer of fat. The bars will slide right out of the pan! Cut the cheesecake into 16 bars. For the cleanest cuts, I use a granton blade slicer. I dip the knife in a dish of hot water and quickly dry it with a paper towel before making a cut. Then repeat. 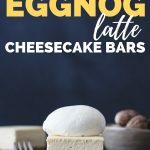 WANT TO SAVE THESE EGGNOG LATTE KETO CHEESECAKE BARS FOR LATER? CLICK HERE TO PIN THEM TO YOUR FAVORITE KETO PINTEREST BOARD!